When our patients share their great Memorial experiences with us, it means more than any award we receive. "Everything was made so much better by the staff and by the hospital." Melissa was delivering her and her husband David's fifth baby at Memorial Hospital East's Family Care Birthing Center when there were complications. Read their story to see how the Memorial team put them at ease. "They made me feel like I was the only one there." Brittany had visited Memorial Hospital East's Family Care Birthing Center a number of times before delivering. Read about her experience with the Memorial team. "Everyone I dealt with, they were fabulous!" After experiencing leg pain, Jessica learned she had an aortic bypass. Surgery at Memorial's Heart & Vascular Center of Excellence saved her leg. Watch her story to see how she's doing now. "I could not have received any better care." Although she was facing a breast cancer diagnosis, Julie had a wonderful experience working with Dr. James Clanahan, medical director of Memorial's Harold & Dixie LePere Breast Health Center. Check out her story to learn more. "They give you hope and encouragement." Following a stroke, Judy was referred to Occupational Therapy and Physical Therapy at Memorial's Orthopedic & Neurosciences Center. Check out her video to see what Judy thinks of Memorial's Rehab Services. Bill was referred to Hand and Shoulder Therapy at Memorial's Orthopedic & Neurosciences Center after multiple surgeries on his hand. Watch his video to see why he enjoyed working with the Hand Therapy team. "Both Tammy and Katie showed amazing, amazing care and compassion for me." Brandy was suffering from a migraine and chest pain when two very special Memorial team members put her at ease. Read Brandy's story about Tammy and Katie. Have you been truly rewarded by an experience at Memorial? If so, we'd love to hear about it! Check out the most recent awards Memorial Hospital Belleville has received. 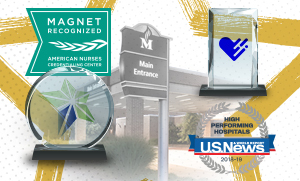 We are honored to be an award-winning hospital. 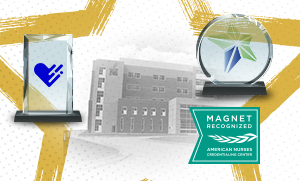 Check out our most recent awards. 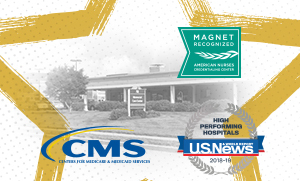 Memorial Care Center has received some prestigious honors. Check them out!